In last week’s column about living honestly, I began writing a list of areas where God is calling me to be more truthful in my relationships. Part of the reason for self-assessment is that sometimes we avoid speaking clearly and honestly out of fear of rejection, hurting someone’s feelings, or a sense of responsibility toward meeting needs and helping people. Truth-speaking is obviously always a good practice, but when we are confronting any area or issue that might be uncomfortable, it is especially important to be prayerful and to have built relationship. Is how I am handling this communicating care? In my family life, areas of ministry, and both of my businesses (publishing and essential oils), “communicating care” is where it all breaks down for me. If I can’t do this well, I may as well pack it all up and go home. Even when my answer is “no,” “not now,” or “that is not a way I can help,” it is paramount that I convey kindness. Close personal relationships are the polishing ground for the edges in our personalities and ways of interacting. Because we care more on that level, we are more invested. Good boundary-setting and clarity-with-kindness go a long way toward expectations being more realistic on both sides. I actually wrote this right after Christmas 2018, but I recently revisited because in New England we have a delightful weeklong break in mid-February. You see, if I’m not intentional about the disruptions of everyone being home on break, our time off together can be an epic fail. Know what I mean? Whether it’s a vacation you have planned, a school break, too many snow days in a row, or a holiday, time together does not have to be chaotic and tense. For our family, we actually needed it to go so far as to be restorative and healing. It was a huge prayer on my heart. If this is you, read on. Our holiday break a few months ago brought peace and refreshing in only ways God could have orchestrated. I’m back—I think—for now. My Advent season went off the rails. In short: We are still troubleshooting causation of a significant health decline in one of my children, and we have seen more specialists than I have money for copays—but that’s a story for another day. We may be talking about parasites. Still waiting on that result. Why parasites? Because we spent two years on a tiny island in the South Pacific Third World a decade ago. And my child is not absorbing proteins—which pretty much screws up health on several counts. We had a good Christmas. I hope you did, too. We are trying some new supplements while we wait out answers, and there was stability and peace. Even so, I simultaneously slapped the back end of 2018 goodbye with a firm “Harrumph!” (Thank you, Urban Dictionary!) while fearing that the New Year would drop us back where we fell around Thanksgiving: fearful, despairing, shaken. So, as the high schooler and middle schooler went back to school, I found the quiet to reflect on what worked for us this holiday break. I do this in the hopes that next year, or any year where we need healing, we remember what to do, with any necessary adjustments. To begin, I want to ask us all a question: Do we feel we have to answer the door every time there is a knock or doorbell ring? If I’m not expecting someone, I don’t always answer, especially if answering means grabbing a robe, hurrying out of the bathroom, or interrupting something going on that needs my full attention. I will fully disclose that I’m not much of a phone or drop-in visitor person; however, if a knock sounds urgent, I usually make an attempt to answer it. Otherwise, I don’t feel I have to get to it just because it’s a noise beckoning me. Same thing with the phone ringing. Why do we feel we have to entertain negative voices when they come along? Why do we let them in, help them take their shoes off, hang up their coats, and invite them to take up space in our living rooms? Why do we mislead them into thinking they are welcomed and may cross our threshold any time that suits them? But I would like to suggest it’s dishonest to let them (the negativity, not necessarily the person) in unless we plan to join them (and I surely hope we don’t). I also think it’s easier to be passive and open the door. Boundaries aren’t for shutting people out, but they are defined as being unwilling to remain in dysfunctional, dishonoring patterns, but simultaneously inviting the other person to come along and engage in—or at first learn—new, healthy patterns of relating. We can invite people to get on that train, but we cannot make them ride it. Now, this all sounds like I have this under control and sit above everyone else doling out boundaries right and left. Quite the contrary. I learn much from those who have drawn them for me over time. Sometimes, their boundaries may be out of over-self-protection, but I still need to observe them. At other times, lines drawn in the sand for me have at least indicated where the relationship could or could not go. Boundaries are like navigational tools to help us know how to relate better with someone. They provide a map of safe topics and interactions and clue us in, if we’re willing to listen, to where we should and should not tread. If we’re careful about communicating, our boundaries should do the same for others. But, bringing it back to negative voices: We don’t have to allow them. Plenty of naysaying goes on in our lives every day—some of it constructive but much of it destructive. When people want to go down Toxic Alley with us, we don’t have to permit it. In fact, they are often looking for us to provide some guardrails for the relationship, and if we don’t, they are like children who don’t know the rules in their own homes: insecure and lost. Not only that, by being passive, we give negativity permission to come in and stay a while. Once it gets in the door, it often takes over the relationship, gets into our heads and hearts, and hijacks everything that could be good or constructive. That doesn’t mean we shut the person (or people) out, necessarily—just the behaviors that are destructive. This can also be true when nobody real is knocking at the door…only our own negative voices from the past. 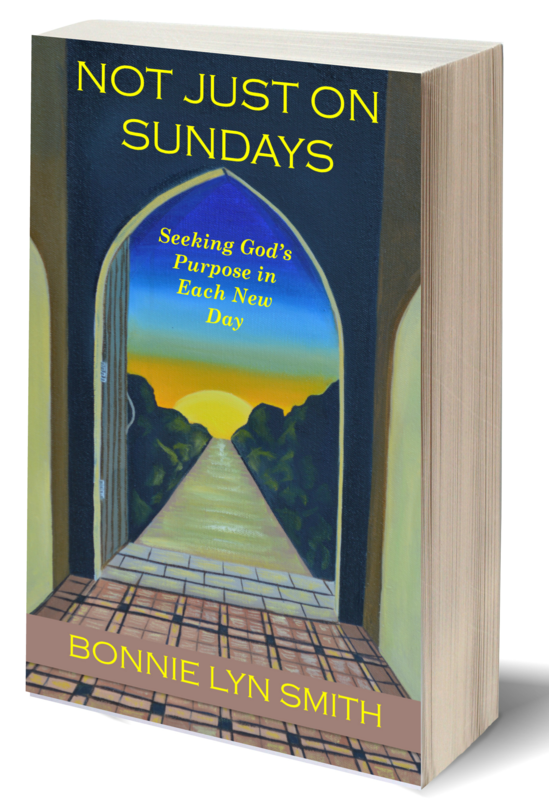 I write a lot about this in Not Just on Sundays: Seeking God’s Purpose in Each New Day. Whatever we have let in and made welcomed will keep coming back. Guaranteed. When we swirl around in negative thinking, we’ve already let the first thought in the door and offered it a cup of coffee. So, how do we stop the madness inside our minds and hearts? The perseverating? Bitter chewing? Stewing in ugly thoughts of insecurity, misunderstanding, misconceptions, wrong assumptions? How do we stop them at the door? We don’t let them in. we do not have to let them in. Here are some answers I draw from my faith in Christ and His redemptive work on the cross. The first selection talks about how not to be anxious (bring it!). Really, doesn’t negative thinking contribute to anxiety, and vice versa? It’s an ever-hungry beast. What’s the remedy for stopping negative thoughts and voices at the door? The peace of God will guard your hearts and your minds. Take every thought captive to obey Christ. God gave us a spirit of self-control (sound mind). We need to ask Him to help us do this. These are His promises for those who believe in Him. Negativity will keep knocking on our doors. It’s part of what tries to invade and keeps our focus off the love of our Savior. There will always be a battle there: either from others or within our own selves. But we now have a loving answer—one with structure, safety, boundaries, healthy relating, and a Savior who spread His arms out on a cross as His pledge and promise to always help us defeat the dark things that plague us. Because He’s already defeated them. And He’s got our backs. For God gave us a spirit not of fear but of power and love and self-control*. **This blog has been shared at any link highlighted here: Mom 2 Mom Monday Link-Up, Make a Difference Mondays, Testimony Tuesday, Women With Intention Wednesdays, Grace & Truth, A Little R & R, RaRa Link-Up, Me, Coffee & Jesus, Dance With Jesus, Blessing Counters, Coffee & Conversation, Saturday Soiree, Tell His Story, Find Stability, So Much at Home, Faith-Filled Fridays, Reflect His Love and Glory Link-Up, Bonbon ‘n Coffee Linkup, and Christian Mommy Blogger.